For many years, chocolate has had the poor reputation of being “bad for you.” But researchers have now discovered that chocolate contains more antioxidants than tea. To make this double-chocolate Easter bunny cake (chocolate cake and chocolate frosting), use your round layer-cake pan. Measure all ingredients into a medium-sized bowl. Use an electric mixer and blend at low speed for 1 minute. Scrape the bowl while blending. Beat at high speed for 2 to 3 minutes, scraping the bowl occasionally. Bake at 350 degrees for 35 to 40 minutes in a greased and floured round layer-cake pan. Allow the cake to cool thoroughly before removing it from the pan. Measure all ingredients into a medium-sized mixing bowl. Blend at low speed for 1 minute. Scrape the bowl while blending. Beat at high speed for 2 to 3 minutes, scraping occasionally. If frosting seems too stiff, add milk by the teaspoon until the frosting reaches the desired consistency. If the frosting seems too thin, add powdered sugar by the tablespoon until the frosting reaches the desired consistency. Remove the cake from the round cake pan. Cut in half. Frost the flat side of one half and put the two pieces together. Place on a platter or a large plate, cut side down. Frost the cake with chocolate frosting. Place two jelly beans for the eyes and one jelly bean for the nose. 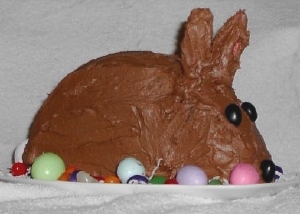 Use a large malted milk egg for the tail. With a sharp knife, cut a hole on each side of the head where you want to place the ears. To make the ears, use the sharp knife to trim a wafer cookie into the shape of bunny ears. Frost the ears. Put a little frosting into the holes to anchor the ears. 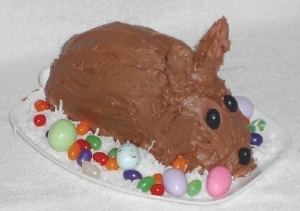 Sprinkle coconut around the Easter bunny cake. 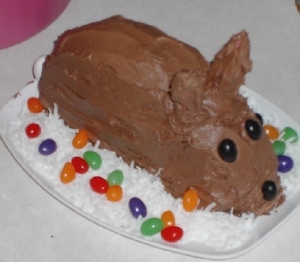 Decorate with jelly beans and malted milk eggs.